Our Organic Cacao Paste comes from raw cacao beans that have been sustainably harvested and delivered to you in a smooth, rich, superfood. Also called cacao liqueur, cacao paste is rich in antioxidants and makes a healthy addition to raw desserts and smoothies. Raw chefs and foodies are discovering the rich, delicious flavor of our Organic Cacao Paste. Also called cacao liqueur, our Organic Cacao Paste makes a sweet and nutritious addition to smoothies, fudges, and baked goods. Culinary professionals love using our Organic Cacao Paste to create gourmet masterpieces on raw desserts, such as ganaches and chocolate curls on cakes and candies. When the raw cacao bean is delicately opened, it reveals a perfect gift: a rich, flavorful treat that has the power to prevent disease, cure illness, and promote a pleasurable outlook on life. Our raw Cacao Paste is gently extracted from the cacao bean, where it is crushed into a liquid that remains solid at room temperature. The paste is collected and packaged without processing in order to deliver a final product that is pure bliss. Our Organic Cacao Paste tastes great paired with complimentary flavors like vanilla, cayenne, maca, rose, or chai spices. Mix a little with some coconut oil for a delectable chocolate sauce or bake it into your favorite breads and cookies. Powder, Paste, Butter, Nibs, Beans - What's the Difference? Cacao beans are the actual beans, extracted from the pod. They are in their whole, original, unprocessed form. Cacao nibs are cacao beans that have been broken into smaller pieces, making them easier to chew and enjoy. Cacao paste is made by taking the cacao beans, in their whole form, and grinding them into a liquid, commonly called cacao liquor. This liquid is then dried, resulting in cacao paste. Cacao butter is the fat, extracted from cacao bean. Finally, cacao powder is what remains of the cacao liquor after extracting the fat. Cacao is simply raw chocolate, straight from the cacao bean. Its scientific name, Theobroma, literally means “Food of the Gods,” and this superfood was thought by the Aztecs to be of divine origin. The cacao tree, which is cultivated in Mexico and South America, produces a food that is packed with so many healing and nutritive properties that the Mayans placed incredibly high value on the food and used the bean for currency. A favorite Mayan way to enjoy cacao was to make a traditional drink, called Chocolatl, which was a mixed with a little vanilla and other flavorings. It wasn’t until the early 15th century that Christopher Columbus brought the health and restorative benefits of the cacao bean to Europe. In 1519, Cortez introduced cacao to the upper class in Spain and the bean rose in popularity as a cure for many illnesses. During the 18th century, chocolate houses began to pop up in London, and the spread of cacao as a revered food is history. Today, cacao is planted worldwide and people around the globe associate chocolate with “feeling good.” The name cacao was thought to be Anglicized at some point and turned into the more common pronunciation of “cocoa.” Now, the two words are often used interchangeably. Pure, unprocessed cacao contains more antioxidant flavonoids than blueberries, black and green teas, and red wine. 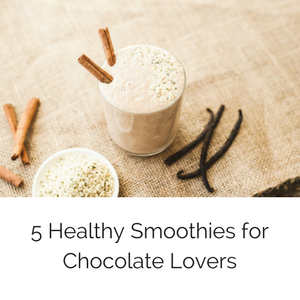 When close to its natural state, the cacao beans, nibs, powder, and butter harness a powerhouse of nutrients that have been said to help lower cardiovascular disease and reduce stress. Chocolate has often been referred to as a "guilty pleasure" or a "junk" food. But these labels only apply to the many commercial varieties of chocolate that are sold on the market. Much of the chocolate manufactured today is mixed with varying degrees of sugar, milk, and other additives, and may in fact contain little “pure” chocolate at all. 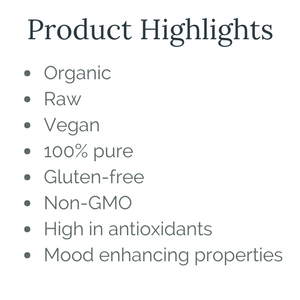 Our cacao butter comes to you in a raw form, retaining all of the benefits from the original cacao bean. Cacao is the best source of antioxidants on the planet, having the ability to lower cholesterol, blood pressure, and risk of stroke. Consuming pure cacao promotes good cardio health, helps dilate blood vessels, regulates blood pressure, and reduces risk of heart attack. Studies show that cacao contains neurotransmitters, which increase levels of specific chemicals in our brain that promote positive outlook, facilitate overall rejuvenation, and help to elevate mood. Eating cacao causes a release of endorphins that give a pleasurable sensation that can reduce depression, heighten mental clarity, and provide a general feeling of well-being. Raw cacao is one of the best dietary sources of magnesium, which balances brain chemistry and helps build strong bones. It is also packed with calcium, iron, zinc, copper, potassium, manganese, and sulfur, a mineral that promotes healthy skin and aids in liver detoxification. Our cacao is harvested much in the same manner as the Aztecs did thousands of years ago. Handpicked cacao pods are allowed to ripen for 5-6 months on trees in South America. After the pods are harvested, they are washed with purified water to cleanse, gently cut open, and the cacao beans are extracted. The beans are then naturally fermented for several days, during which a chemical change takes place reducing the bitterness of the bean and releasing a rich, delicate flavor that is evident in all our cacao products. The raw chocolate is cold-pressed and the cacao butter is separated. This carefully monitored process results in a variety of wonderful ingredients along the way, delivering the finest cacao nibs, powder, and butter available. Serving size is 2 Tablespoons. 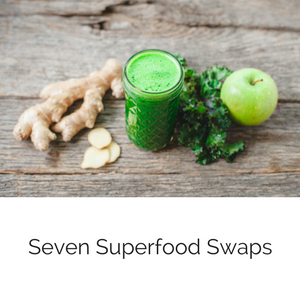 As with all superfood powders, listen to your body, as you may find that either a smaller or higher intake is more suitable to your body. We recommend that you start with the recommended daily amount, and, if desired, gradually increase or decrease your daily consumption.